A very exciting part of gull-watching for me is finding banded individuals and retreiving their histories from the Bird Banding Lab. I've reported quite a few birds in the last two years, and have had so many conversations on the phone with the lab, that some of the employees there have come to personally know me as the "gull guy". What a legacy. 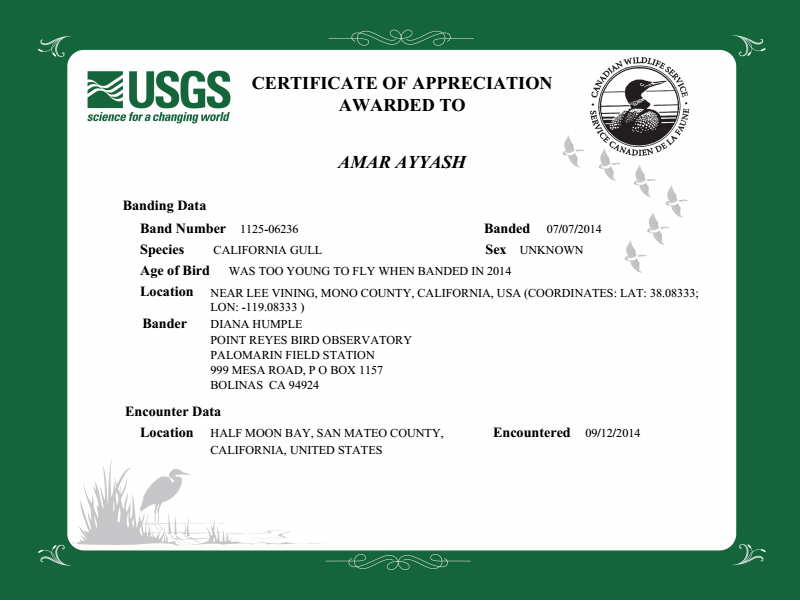 California Gull (juvenile). Half Moon Bay, California. 12 September 2014. It's not unusual for the database to be missing data on juveniles, particularly because of banders who haven't submitted their logs (it's a lot of data). The other reason one might get a delayed response from the lab is if the band is very old and predates some of the electronic records (rarely a problem). Mostly black bill and juvenile scapulars (slightly late hatch?). Also note the cinnamon tones to the breast, neck and loral region. Mostly all of the juvenile scapulars have been replaced and the bill has taken on the classic "bi-colored" pattern that 1st cycle California Gulls are readily identified by. In addition, a few lesser upperwing coverts as well as a single, inner, greater covert have been replaced (the latter perhaps adventitiously). Is it likely this individual fledged well before the subject bird? Surely it must have taken some time to acquire all of these post-juvenile scaps (PF/PA1?). A similar thing occurs with our early Fall Ring-billeds here on Lake Michigan. A cohort of hatch year RBGUs on the same beach can have scapulars that range from entirely juvenile to almost all adult-like gray. I've for some time now believed they have to have different hatch/fledge dates. Off to the next one.